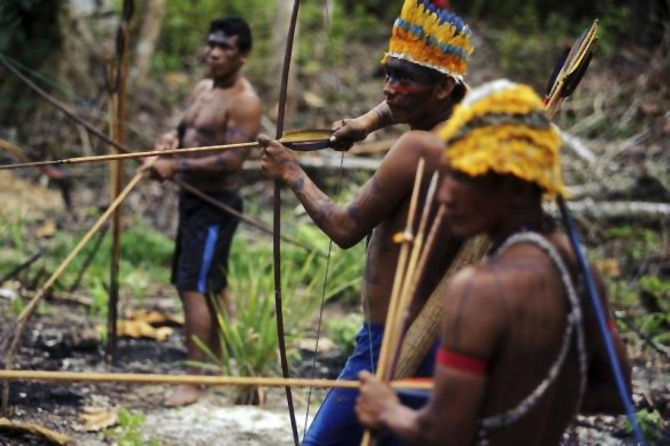 The Munduruku tribe has seen their land encroached on by wildcat miners in search of gold, and the tribe's leaders travelled to the capital Brasilia last year to demand the federal government remove non-indigenous miners from their territory, says Reuters. 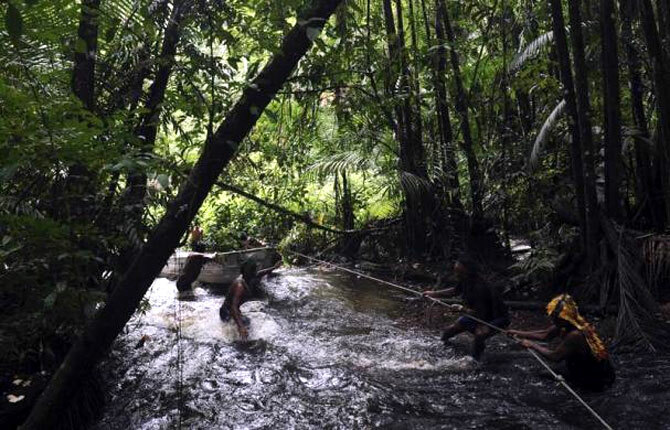 Image: Munduruku Indian warriors navigate the Das Tropas river, a tributary of the Tapajos and Amazon rivers, as they search for illegal gold mines and miners in their territory in western Para state. 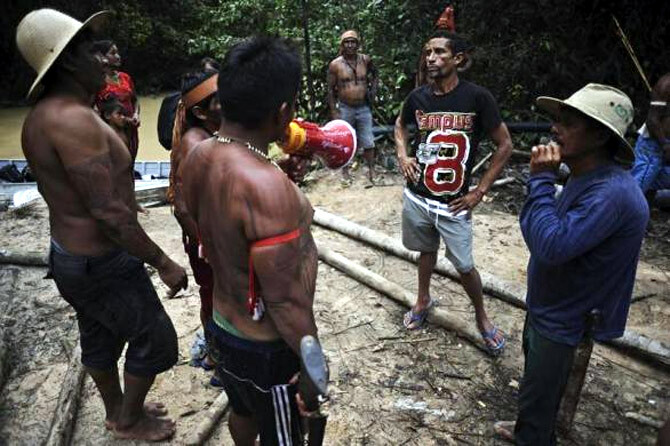 Rather than wait for a court decision to start the process - which could take years - the Munduruku decided to take matters into their own hands and expel the wildcat miners. 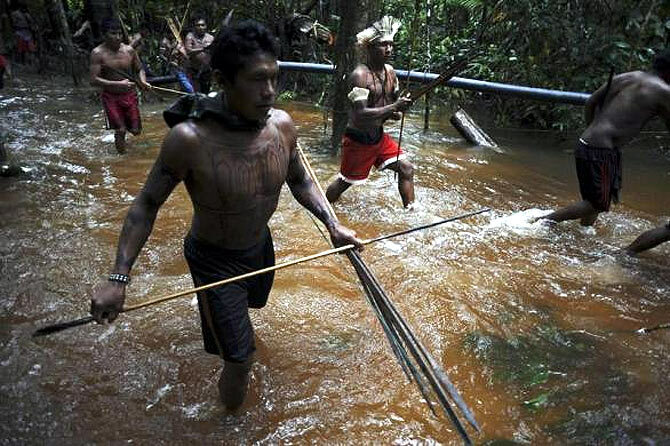 Image: Munduruku Indian warriors navigate the Caburua river, a tributary of the Tapajos and Amazon rivers. Munduruku Indian warriors approach a gold mine as they search for illegal gold mines and miners in their territory near the Caburua river in western Para state. 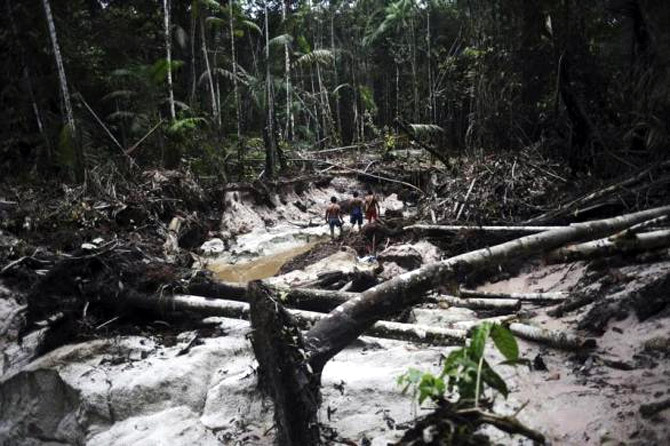 Munduruku Indian warriors approach a gold mine as they search for illegal gold mines. 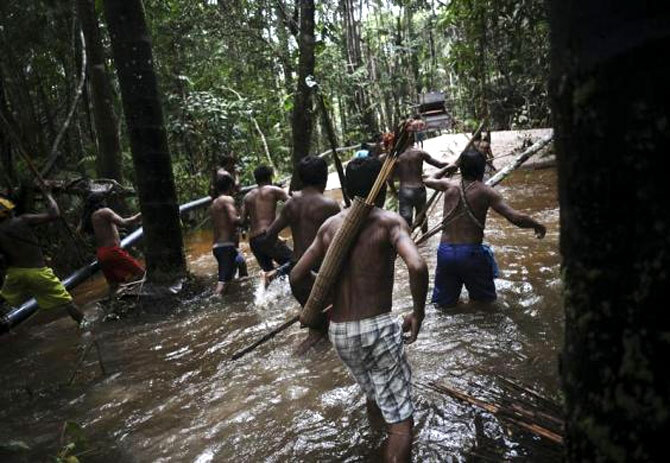 Munduruku Indian warriors search for illegal gold mines and miners in their territory near the Das Tropas river, a major tributary of the Tapajos and Amazon rivers in western Para state. 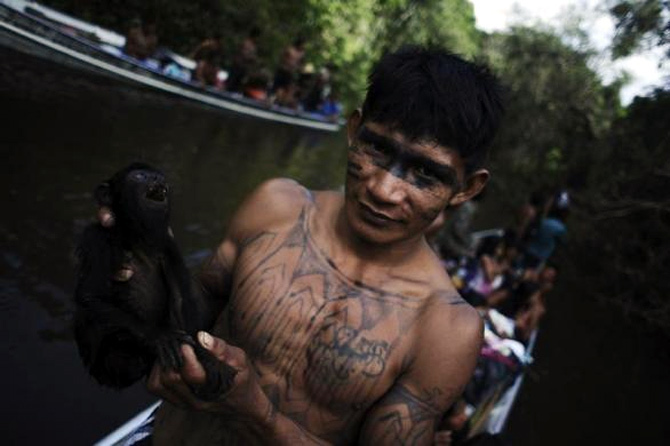 Munduruku Indian warriors inspect a wildcat gold mine as they search for illegal gold mines. 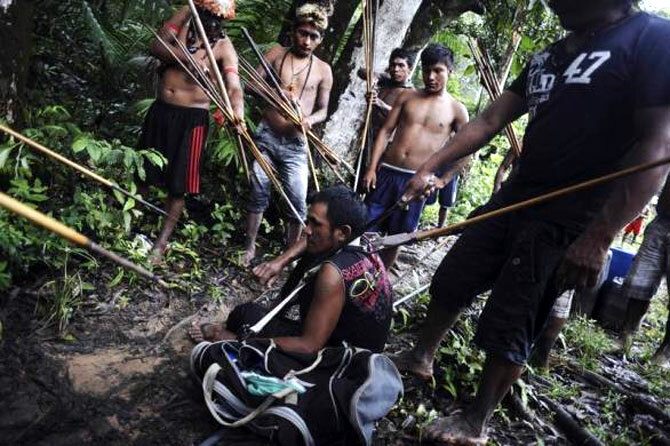 Munduruku Indian warriors stand guard over an illegal gold miner who was detained by a group of warriors. 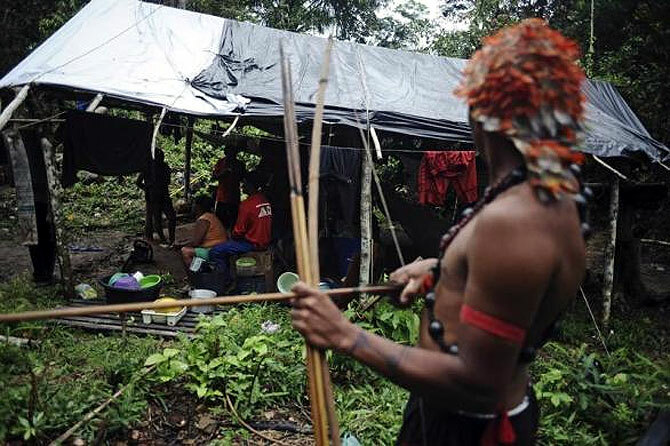 A Munduruku Indian warrior stands guard near illegal gold miners who were detained by warriors searching for illegal gold mines and miners in their territory near the Caburua river. 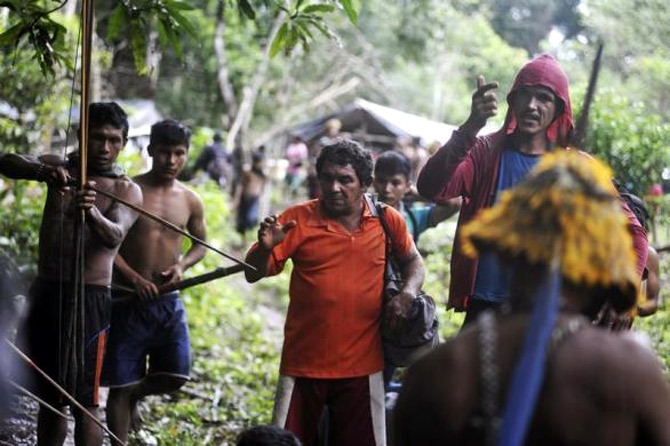 Munduruku Indian warriors order non-Indian gold miners (R and 2nd R) out of their territory, during an operation to search for illegal gold mines along the Das Tropas river. Munduruku Indian warriors stand guard over gold miners. 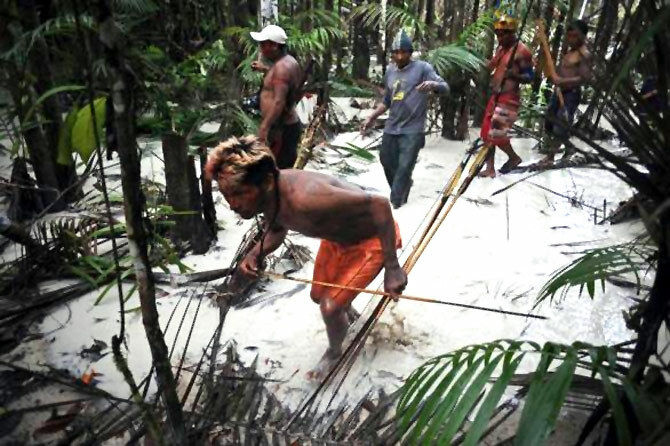 Munduruku Indian warriors search for illegal miners. 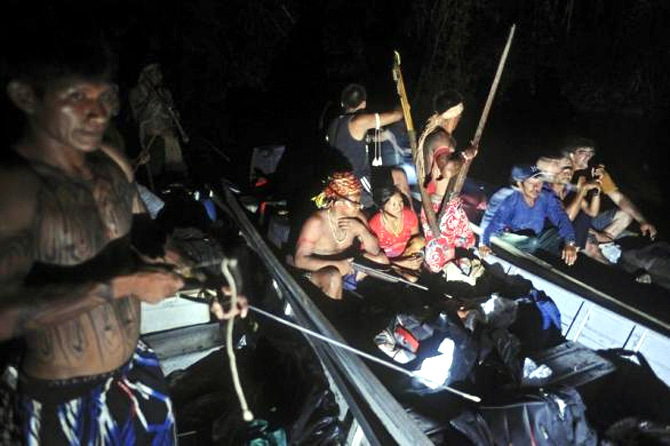 Munduruku Indian warriors transport illegal gold miners by boat (far R) after they captured them near the Das Tropas river in western Para state. 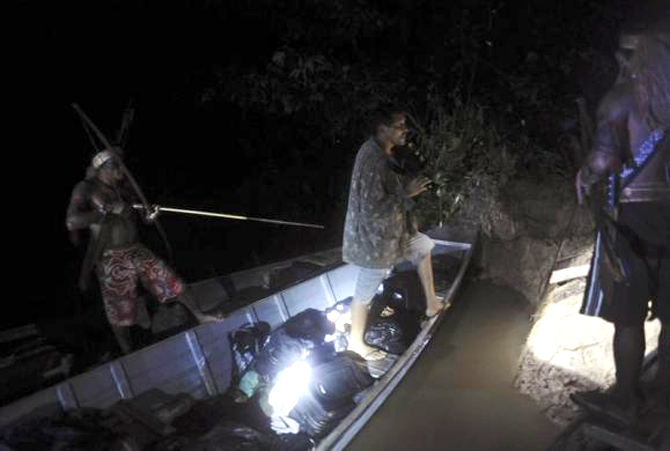 An illegal gold miner (C) steps off a boat after being captured by Munduruku Indian warriors (L and R) during a search for illegal mines and miners in their territory. 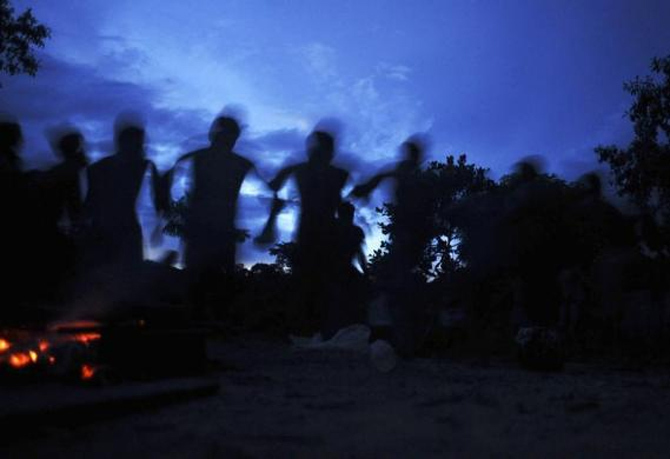 Munduruku Indian warriors dance and sing traditional songs after stopping for the night on their search for illegal gold mines and miners in their territory near the Kadiriri river, a tributary of the Tapajos and Amazon rivers. 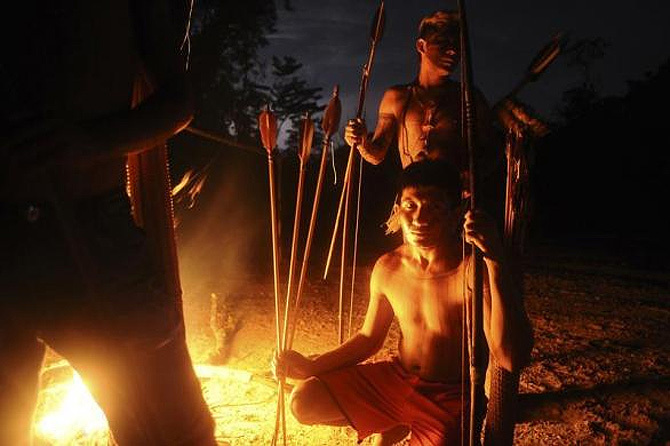 Munduruku Indian warriors light a campfire at the site of an illegal gold mine they discovered during a search for illegal mines and miners. 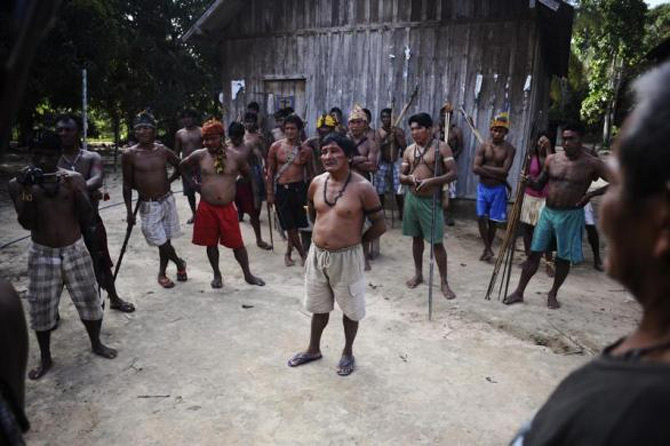 Munduruku Indian warriors hold a meeting while on their search for illegal gold mines and miners in their territory. A Munduruku Indian warrior carries a monkey he hunted for food during a jungle search for illegal mines and miners in their territory. 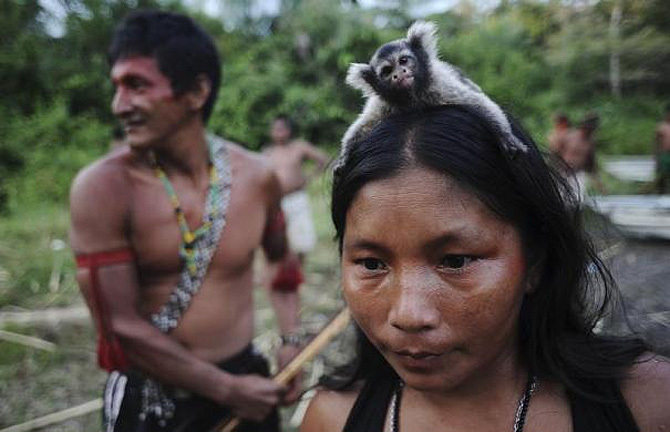 A Munduruku Indian woman warrior carries a monkey on her head while on a search for illegal gold mines. 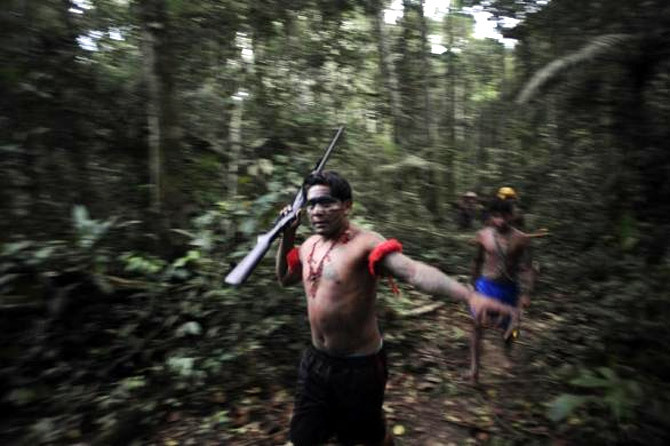 Munduruku Indian warriors prepare themselves as they approach a wildcat gold mine during a search for illegal mines. 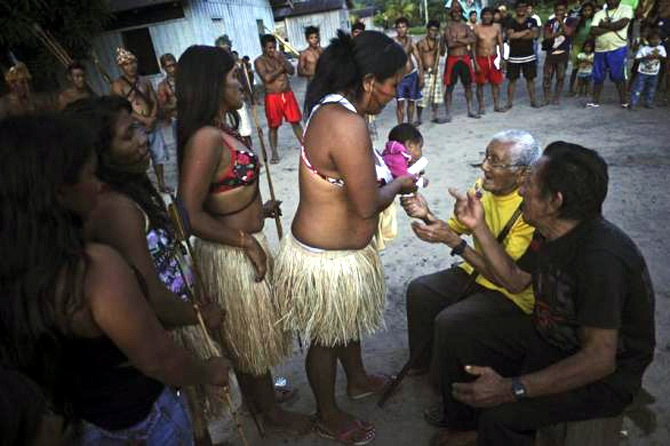 Munduruku Indian women warriors pay their respects to the oldest living leader of their tribe, Biboy (2nd R, yellow shirt), at the end of a day of searching for illegal gold mines and miners in their territory, in the village of Katin near the Kadiriri river.